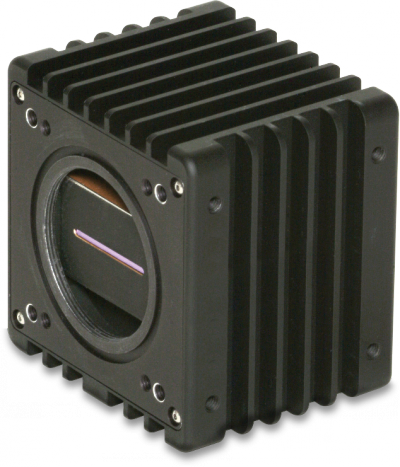 The model 1024-LDM camera is a high-speed 1024-pixel linescan InGaAs camera for use in high-resolution imaging through silicon wafers, blocks or ingots. The 1024-LDM Linescan Camera finds problems such as mis-alignment, occlusions, inclusions or cracks; before the expense of further processing of ICs or solar cells. High-speed imaging of free-falling molten glass gobs, agricultural raw materials, or pharmaceutical mixes also benefit from the camera’s flexible line rates of up to 45,956 lps. Only 2.4 inches in depth, the mechanical design gives system integrators the flexibility to fit the camera inside their inspection machines. The LDM provides 14-bit digital capture into base-format Camera Link® interface cards, while providing dynamic ranges up to 4500:1. A photoetch mask sharply defines the array’s 25-µm aperture, ensuring high time and spatial resolution; the alternate 500-µm pixel height trades time resolution for increased sensitivity in photoluminescence imaging. 2Accessory Kits: Include power supply, carrying case, SMA-BNC trigger in and sync out cables, o-ring, carrying case, mini-CD with manual and free SUI Image Analysis software for National Instruments Camera Link frame grabbers.